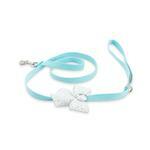 Put a Big Bow on your bundle of joy when out to show how special they are in the Tiffi's Gift Dog Leash by Susan Lanci! Get your parties started by making sure the life of the party is dressed to empress in the Tiffi's Gift Dog Leash by Susan Lanci. 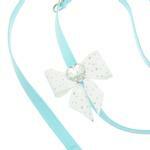 It has a big white stardust Tailbow with a heart-shaped Swarovski crystal in the center. 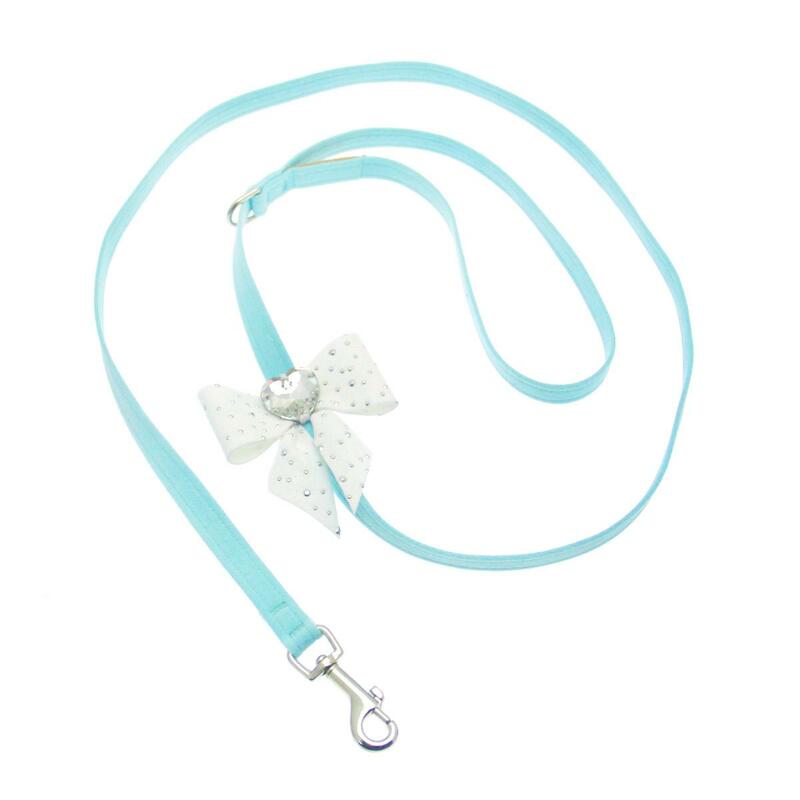 Leashes are designed to match all of our collars and harnesses. The beauty of Swarovski and the strength of Ultrasuede make this a must-have. Four to six feet in length with a snap hook that has a heavy plated nickel-silver finish and matching “D” ring located just below the hand look – great for keys, pick-up bags or attaching the Susan Lanci Designs Travel Pouch. Lightweight and comfortable for you, easy to maintain and constructed from a commercial grade material, this leash is a good value that will last a long time. Like all of our designs, it is made from genuine commercial upholstery grade Ultrasuede® fabric that we import from Japan. This soft, comfortable fabric is breathable, washable and colorfast. Lastly, this leash is manufactured in the USA. Look for the matching Tiffi's Gift Tinkie Dog Harness, sold separately. For a step-in style, your pup will love the Tiffi's Gift Step-In Dog Harness, also sold separately.